"Oh... They are... So I kinda have to train myself to relax. If I tense then the pain will get worse. And yes. Boulder will be raised well. I'm going to take good care of him". Feeling Shadow groom her light grey soft fur, she began to relax a little more. "Since the contractions seem very very far apart, it seems like I will give birth in the next 2 weeks or so... We'll all have to see". Amethyst felt another smile form on her face. She noticed that Shadow really cared for her and to make sure that she was doing well. Her tail moved slightly to the left a little, then back to wrapping around her friend comfortingly. "Time seems to hold the secrets and answers to everything," the ivory pelted spoke with a soft sigh at the end. Allowing her eyes to close it almost felt as if she was going to doze off to the melody of the breeze whistling and pack talking amongst one another. "Are you looking forward to finally seeing your pup?" Shadow asked, her voice almost a whisper. The femmora had no doubts her friend would make a great mother but at one point every mother did dread over raising a little pup. Amethyst looked up at Shadow again. "Yeah. It does seem like exciting news. I know Boulder is going to look very cute. Being a mother might sound like a lot of hard work, to me it's kinda a pleasure...". Her voice drifted to a whisper. A very relaxing tone. She noticed that Shadow looked a little tired and sleepy. "Are you okay? You look like you are about to drift off to sleep...". She spoke softly towards the ivory female. Her tail curled around her more, wondering if she would really drift off into a sleep state. She then looked about into the distance, listening to the soothing sound of the whistling wind. A sleepy feeling came over Amethyst as well. She put her head close to her friend and allowed her eyes to close. Opening a single eye lazily, the pale femmora watched her friend closely, her snow coloured tail flicking against Amythest's flank. "It will be exciting, you are going to be caring after a creature which will be looking up to you and following your every paw step," Shadow spoke with an energetic tone which quickly fell back as she continued to speak softly, "It's just so peaceful, and it seems ridiculous to be tired since I have done nothing during this entire day." Lifting her head and giving it a single sharp thrash to the side, the heavy urge to sleep quickly vanished from the fae's body. Amethyst opened her eyes and looked up at Shadow once more,nodding in agreement of excitement about the pup. "Yep. Next thing I know the pup will be running around and I'm going to have to catch it and watch over it 24/7". She got that image in her head just as she said it out loud. She didn't feel like sleeping at the moment, even though it was going to be dark soon. She imagined little Boulder running around outside the den, it's mother looking after it and watching as he played around in the soft grass. She turned her attention to Shadow saying something about the outside being really peaceful. "Yeah. It has been very relaxed out here recently. Wonder when the rest of the snow is going to melt. I mean... It's summer and all the snow should've all melted by now". She remembered when she saw a few patches of snow left on the ground for the warm sun to melt. "I guess you cannot control the little monsters," Shadow spoke with a light chuckle. Noticing the shade slowly shift along the remaining white canvas the ivory female wondered if the snow ever melted in this place. Even if the snow melted would there be any foliage hidden beneath the ice or secreted in the soil. "It's strange to see everything so calm," the ivory hued femmora admitted, she was used to silence away from the den but never near it. "I suppose only time can tell us if the snow will ever melt." Amethyst agreed and nodded her head again. "Yes. You have a point there. Time will tell. So if it melts, it melts. Either way, its going to come back again". She again buried her face into the soft fur of the ivory female. She liked the scent of her. "I have to say, you have a very pleasant scent, even I love the scent". Her voice could be heard clearly except for it was muffled by having her face in Shadow's soft fur. She then heard her stomach growl a little. Her ears flicked to the strange sound from below her, a sign that she must be hungry again. "Well. I guess I have to go look for food. That is, if I can get up...". She began talking to herself now. "Come on muscles, do your thing for me! I don't like being weak...". She struggled to get up and she fell to the ground again. "It's useless... My body isn't allowing me to get up... I don't really know if this is too much to ask for someone like you... But could you find me some food?" She smiled and waited for Shadow's reply. Shadow felt the gentle weight of her friend resting her head on the femmora's ivory pelt. Perking her ears in surprise, the fae chuckled hearing Amethyst comment on her scent. "I do walk around the barren landscapes quite a bit," the fae admitted, her tone light and joking. Turning her head to watch her friend attempt to rise to her paws a spark of concern lit within the pale coated fae, she quickly hid her worry knowing Amethyst's state was only natural and could not be changed in the present time. "Of course I will go out hunting," the femmora replied quickly jumping up to her paws. The beckoning thrill of a hunt quickly eased her worry and changed her calm state to what seemed like an infinite amount of strength. "Do you have a certain preference?" the fae quickly asked, knowing occasionally wolves had preferences. Amethyst thought for a moment. What was on her mind for a snack? "Could you hunt down a hare for me?" She asked kindly. She knew she had seen Shadow hunt down a hare before. "Oh, and you are very welcome for the compliment I gave you about your lovely scent". She smiled as she watched her friend get up and look for a hare around the den. "My muscles are not really working for me today... Maybe when I go to sleep in my favorite spot deep inside the Koti den, I'll have to slide myself in there...". She sighed again. Perking her ears a little to the soothing sounds of the wind and distant conversations of wolves talking amongst one another, she couldn't agree more on what a peaceful day this was. "I'll be back soon," Shadow called over her shoulder as she bounded away, her paws carrying her easily over the melting snow. Dashing up the slope, the fae kept close to the den but far enough for the blindest hare to explore. Coming to an abrupt stand still, the fae parted her jaws drinking in the frigid air and closed her eyes focusing on the task at hand. Picking up the stale scent of a hare, the former Jeager did not let the possible opportunity go to waste. Snapping her eyes open, she streaked after the faint scent trail following it until it became strong and fresh. Amethyst happily smiled as she watched the ivory female go and hunt a hare. She just hoped that she wasn't being pushy about it. She rested her head on the ground, picking up the scent of her white lilly that she was still wearing around her neck. It reminded her of her mate. It had been a long while since she last heard from him. The white lilly helped her to calm down and forget all her troublesome worries, because of its strong scent. Her gold eyes focused on what the former Jeager was doing and she was amazed of how well this female could hunt. She was dazed, almost like a light trance state. She then snapped out of it a second later and looked down at her paws. Crouching down, the fae slowly stalked forward her pelt blending in with the remaining white canvas. The hares fresh tracks lead her alongside a hill's loose crescent shape and toward the outlines of boulders covered in a thin white blanket. The light brown fur stood out clearly amongst the snow, for the winter time it was unusually plump for the harsh conditions. A loud snarl tore through her throat as she lunged at the space between the hare and the den. The echoing snarl startled the hare which swiftly took off toward the pile of hidden boulders it called home. Timing her leap perfectly, the ivory fae landed atop of her prey. Her white incisors caught the light gleaming dangerously as she plunged them deep into her prey's neck. Veering sharply away from the rock pile and back to the den, the fae's breathing was normal despite the fact her heart was racing. Amethyst was able to see and watch what Shadow was doing from a distance. She had good eyesight which was good. A very long time passed and she saw that Shadow had returned from her hunting session. "You're back quickly. Maybe I am experiencing time distortion...". She then looked at the hare that Shadow had brought back. "You really have those awesome skills, don't ya?" she asked in a very relaxed tone of voice. Her right ear perked and turned to a distinct sound in the distance. It was just a tree swaying and making a little noise. She then turned her attention back onto her friend and smiled. Shadow gently set the limp plump hare before Amethyst's lightly toned paws and stretched out next to her friend, claiming the very spot she had been in before. "You are fine Amethyst," the ivory fae said while she gently nudged her friend in a playful manner, "the hare just really wanted to be your next meal, ran right into my paws for you." Noticing her friend's ears perk toward a distant noise, Shadow tilted her cranium and glanced in the direction. Glacial pools lingering on the gently swaying trees, the fae did not catch anything which seemed alarming. Amethyst smiled brightly as Shadow slid the limp hare over to her paws. She sniffed it and sank her teeth into it's limp body, getting all she can out of it. She saw her friend lay down next to her. She loved when she had company close by. Nothing seemed alarming around anyhow. Everything was quiet, and everything was calm. 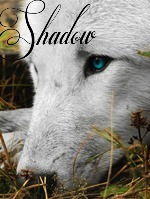 She again put her head on Shadow's soft ivory pelt and listened to the beat of her heart. It sounded fast, but that was only because she had used the energy to hunt. Amethyst allowed her mind to go blank and to let her thoughts drift away from her. A small portion of the hare was left. "You can have the other half if you want". She thought that Shadow deserved to have a snack on her behalf of taking the time to actually hunt the thing down. Her gold eyes sparkled with kindness and it felt so good. Turning her glacial pools to the sky, the femmora observed the clouds slowly drifting by on the soft breeze. Feeling a comforting weight press against her ivory pelt, the fae looked away from the clearing skies to give her friend a small smile. Dipping her crown to Amethyst in a silent thank you before turning her attention back to the carcass' remains. Lowering her muzzle and parting her crimson coloured jaws still gleaming freshly from the recent kill, the femmora tugged away at the remains until only the skeleton and a few organs were left. Cleaning her muzzle, the fae lowered her head to rest it on Amethyst's paws. Slowing her breathing in an attempt to slow her racing heart, the fae relaxed herself drinking in Amethyst's scent along with the woven scent of the precious flower remaining intact on the fragile chain. "It's so calm today," the ivory femmora commented, her tone quiet as if afraid to pierce the silent air. Amethyst sighed happily. "Yeah it is. Very relaxed out here. I actually love when it's like this". She then looked at the white lilly again, remembering that it's lovely scent always calmed her. Maybe a little too much. Her tail curled around Shadow again. She smiled at her as she noticed that the hare carcass was completely gone. A warm breeze came over her and she took it in by giving a big deep breath, allowing the warm air to enter inside of her lungs, cleansing them and making her feel good inside. It was just this time for Amethyst and her friend. She looked up at the sky for a moment to see birds flying about and returning to their homes in the nests. Adjusting her posture, the fae gave into the weight of her eyelids allowing them to slide down her glacial orbs leaving her sight in darkness. Feeling Amethyst's tail curl around her, the fae felt oddly safe and secure in the open area. Resting in silence, the fae felt the warm winds comb through her pelt promising of better weather and easier days. Feeling as if her limbs were coated in rock, the face found even flicking her tail became an effort. Giving in to embracing darkness, Shadow slowly dozed off into a deep sleep. Looking at Shadow and smiling, Amethyst felt very happy to be with her. She felt very safe and secure. Taking in the pleasant scent of the white lilly again, she allowed herself to relax more and more. Her eyelids became very droopy and she rested her head on the ivory female's soft pelt. Listening to the soothing whistling of the warm wind, she felt it run through her fur. Giving in to the relaxation of being extremely sleepy, she allowed her eyes to slowly close, also drifting into a deep sleep. As the energetic femmora plowed silently into the main den site. She would discover a yet playful female as well, (Ihana) padding over, the she wolf couldn't help it lightly pounce on the canid on greeting. Escaping a rarer bubbly giggle as she got off, sorry about that. I happen to be playful, I'm solace. She greeted. Her tonie lolling beyond her maw in an refreshing pant. The white fae bended to scratch her ear leisurely in the sun. Her thick pelage made her breathe heavily in the warming light. Nowadays, the twenty four hour periods had nothing but daylight without an overcast day to be seen. Each day ushered a bright, blue skied day, just has Ihana liked them. These days were especially good for romping about. Her features became animated as she thought of all the amusement she could have on this bright afternoon. She had started off this day by doing nothing, and did not intend to end it by doing nothing. She was just thinking about what to do for her enjoyment, when she felt someone barrel into her. Not hard, but lightly, but herself being quite small, it felt quite hard. She was on her paws instantly when she felt the weight lift off of her, and on her maw formed a snarl. But it quickly vanished when she felt the energy coming off of this wolf in large waves so like he own. She stood, shaking her pelt embarrassedly as she smelt the smell of her birth-pack on this female's fur. She nodded in greeting to her words. "I'm Ihana, Wache of The Katmai Natives pack, daughter of Kendrick the Proti." she mumbled. "Oh, and don't bother apologizing, I do it all the time!" She added with a giggle. "Just ask Gram- Siren, I mean..." She itched her ears self-consciously. 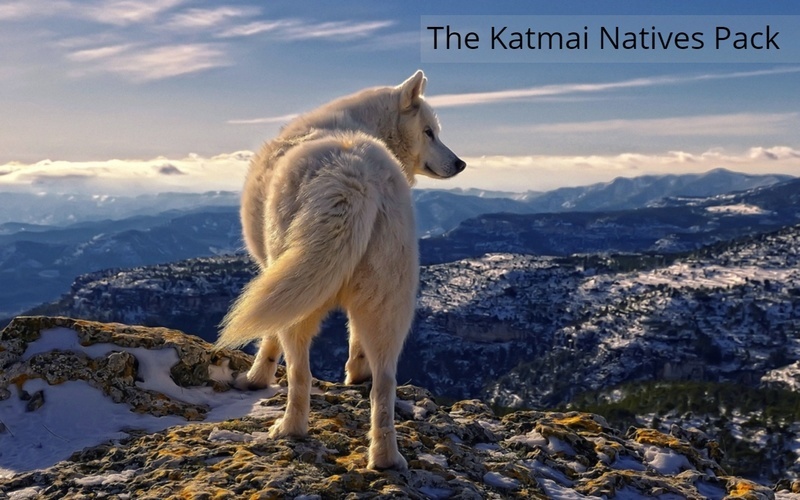 Nakita awoke inside her den, Akita laying happily against her belly and a cool breeze blowing into the den. She knew it was getting colder, but Akita was growing and knew the red and white pup would be able to servive the winter.She gently nuzzled her pup trying to wake her up,so she could feed her.She glanced around the den, the feeling of Marrok's warm body against her's made her smile, and she gently licked his cheek.Her gaze then looked down at her pup, waiting for her to wake up. Akita would wake slowly toward the nuzzle against her petite body. Giving a tired whine she would slowly wake, however curling more into the fur of her mothers as she became just too comfortable with soften silken pelt that made her want to sleep more. Yet she had to get up, otherwise she would be starving later on. And she knew about the nutrients she still yet needs. Nakita felt the small ball of fur move and he smiled as she watched her young pups eyes slowly open. "morning Akita, you ready for your milk." The grey and white fae was full of milk for her pup and hapilly waited for her pup to start suckling.Nakitas ice blue eyes scanned her pup, looking at her tiny laws and features, knowing she would not stay this small forever. The petite fae would lay her paws among the belly of her mother. As she began to suckle. Small sounds would escape in satisfaction as she grew less tired. The den felt warm to her as she felt the warmth of both her parents.